Zero walks in casually with a bored expression on his face as he calmly places his Poke Ball on the counter and asks to get his Machop healed fully. After a few moments pass he receives his Poke Ball back,thanks the Nurse and calmly walks out. I walk in,Ralts on my shoulders and walk over to the front Counter. "Hi there I'd like to check in my Ralts for a bit. He might be a little tired. We had a little battle. He isen't injured just needs to do a little resting." I told the nurse. She smiled and handed Ralts to chansey. "Very well." after awhile I woke up and Ralts sat in my lap,looking up at me. "Ah you're all well?Good lets go capture some pokemon." I say,putting Ralts up on my shoulders. 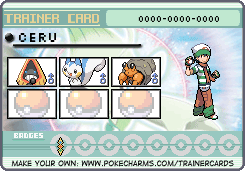 Ceru sprints into the center, clutching his Pokeball, and goes straight up to the nurse Joy. "My Snorunt, please. A pretty tough fight." She just nodded and smiled, taking the Pokeball and assuring Ceru he would be fine in a few moments. Soon she handed the ball back to Ceru, wishing him a nice day, and he wished the same. Grinning, he left the Pokemon Center, and would now start his Pokemon Journey. Axel waltzed on in to the Pokemon Center, whistling a merry tune as he did. He approached the counter, slid the Pokeballs containing Cyrus and Horus over to the nice lady, and then turned around, resting on the counter, both elbows on the counter, tapping his sandaled feet. Thirty seconds later, the Nurse Joy handed both Pokeballs to the young man, who thanked her and was on his way. Most boring trip to the Pokemon Center ever. Of all time. Axel silently vowed to make it more interesting next time.